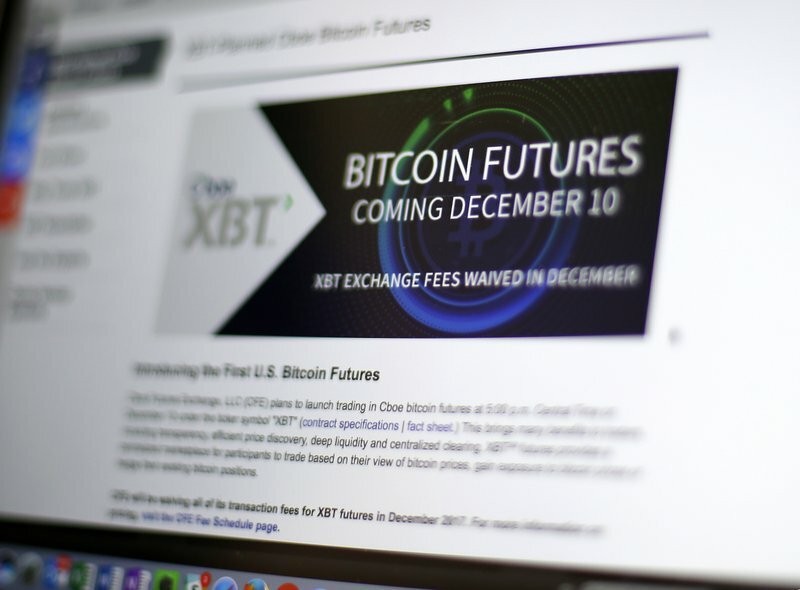 CHICAGO (AP) — The first-ever bitcoin future began trading Sunday as the increasingly popular virtual currency made its debut on a major U.S. exchange. The futures contract that expires in January rose $340 to $15,800 in the first hour and 15 minutes of trading on the Chicago Board Options Exchange. The contract opened at $15,460, according to data from the CBOE. The CBOE futures don’t involve actual bitcoin. They’re securities that will track the price of bitcoin on Gemini, one of the larger bitcoin exchanges. The start of trading at 5 p.m. CST overwhelmed the CBOE website. “Due to heavy traffic on our website, visitors to www.cboe.com may find that it is performing slower than usual and may at times be temporarily unavailable,” the exchange said in a statement. But it said the trading in the futures had not been disrupted. The price of a bitcoin has soared since beginning the year below $1,000, hitting a peak of more than $16,858 Dec. 7 on the bitcoin exchange Coindesk. As of 6:25 p.m. CST, it was at $15,244 on Coindesk. Futures are a type of contract in which a buyer and a seller agree on a price for a particular item to be delivered on a certain date in the future, hence the name. Futures are available for nearly every type of security but are most famously used in commodities such as wheat, soy, gold, oil, cocoa and, as dramatized in the Eddie Murphy and Dan Aykroyd movie “Trading Places,” concentrated frozen orange juice. The futures signal greater mainstream acceptance of bitcoin but also open up bitcoin to additional market forces. The futures will allow investors to bet that bitcoin’s price will go down — a practice known as shorting — which currently is very difficult to do. 0 Response to "Bitcoin futures rise as virtual currency hits major exchange"